Here at CELLINK, we want to inspire you to print more advanced models using the BIO X. In the following section, we demonstrate how to print two droplets on top of each other to create encapsulated droplets. In this video, we demonstrated printing encapsulated droplets composed of CELLINK RGD and CELLINK A. CELLINK RGD was diluted 1:10 with cell suspension prior to printing. To create a droplet core, CELLINK RGD was placed in the first printhead and a droplet was printed with a 25G nozzle. To encapsulate the droplet core, a CELLINK A cartridge with attached 20G nozzle was placed the second printhead and printed a droplet on-top of the CELLINK RGD droplet. Ionic crosslinking of CELLINK RGD core after bioprinting is optional in this application, since it is encapsulated by a thin layer of CELLINK A. Once the CELLINK A is crosslinked it creates a shell that prevents CELLINK RGD from dissolving. Find the G-code for this droplet on droplet printing on Bioverse. 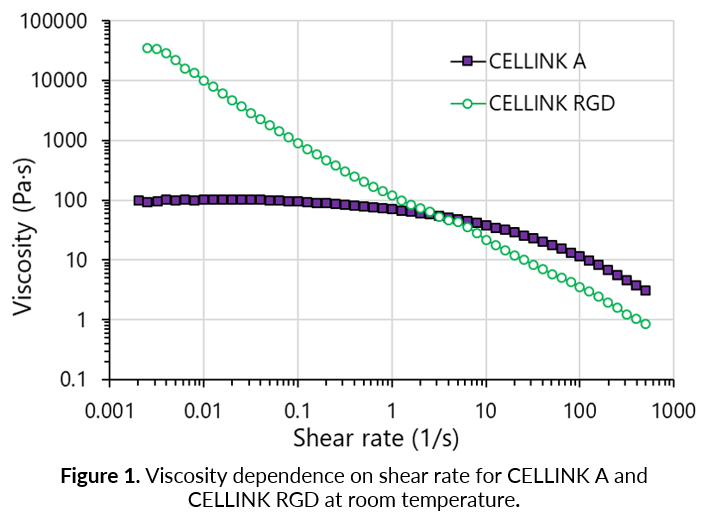 CELLINK RGD is a viscous bioink and therefore makes a stable inner core. On the other hand, CELLINK A bioink has a lower viscosity, which makes it a good bioink for encapsulating the inner core (Figure 1). CELLINK A will form a shell around the printed CELLINK RGD droplet, creating a protective layer for the cells in CELLINK RGD. 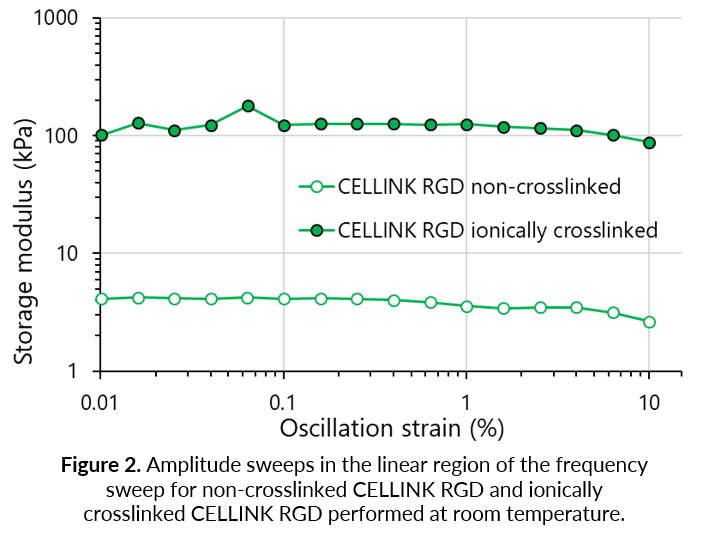 A substantial difference in stiffness between the crosslinked and non-crosslinked CELLINK RGD bioinks has been observed (Figure 2). A softer gel environment can be beneficial for certain cell types, especially for their ability to migrate within the bioink. The construct is crosslinked from the outside and inwards, therefore the outer shell of CELLINK A will be form an encapsulation layer. The degree of crosslinking of the inner core can be controlled by the crosslinking time. A shorter time of immersion in the crosslinking solution will yield a softer core. 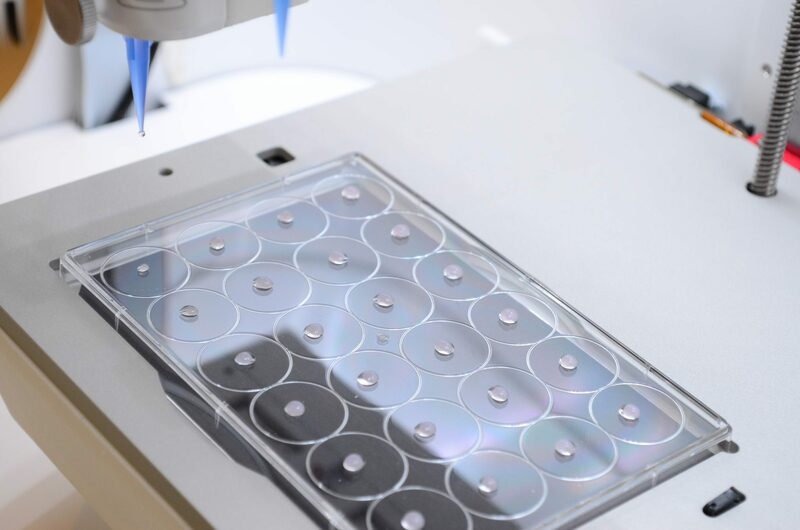 To study diffusion of substances through a barrier in 3D and at medium throughput, droplet encapsulation bioprinting can be conducted for a single cell type in two different bioinks. The inner core of the droplet can be CELLINK RGD encapsulating the cells. The RGD peptide, which is incorporated in the bioink, will promote the attachment of cells to the inner bioink. If this bioink is not crosslinked, the softer hydrogel will enable migration of cells through the bioink. The outer shell of the droplet can be created with CELLINK A, which can be crosslinked to protect the inner non-crosslinked CELLINK RGD core from dissolving. That way, CELLINK A can act as a passive shell in which diffusion of substances is facilitated.